The white-washed building comprises a detached, L-plan, three-bay, single-storey school house. The gable end of the projecting porch includes a name-plaque which reads ‘Gortnabinni National School’ though there is no date. Drawing architectural comparison with the school houses at Whiddy Island, and Réidh Reamhar my guess would be that this school was built sometime between 1880 and 1898. Why 1898? 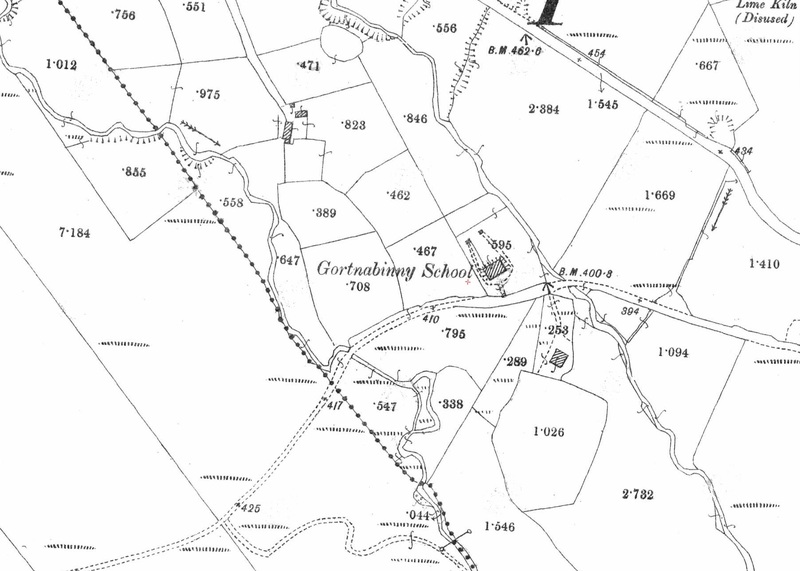 ; the school building is marked on the Second Edition 25 inch Ordnance Survey Map (1893-1898) for the area which shows the building located on the low hill, with footpaths leading to the rear of the school where there are two outbuildings, most likely toilet blocks. It is squeezed between two small streams with only one other building nearby. 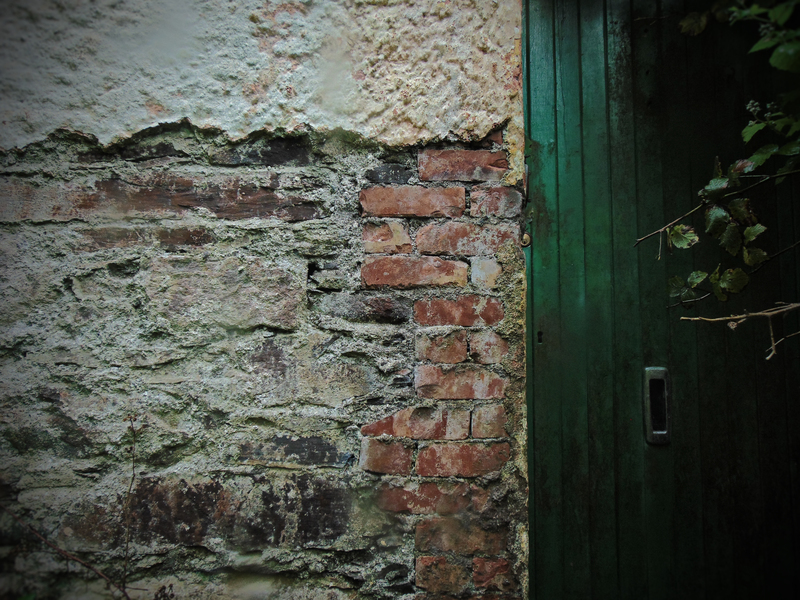 The door of the building is unlocked and as make my way inside, I notice that the crumbling plaster-work has revealed the appealing pattern of the roughly coursed stonework with brick quoining underneath. Although the school was built to a standard plan supplied by the Office Of Public Works at the time, it was constructed of local materials by local people. Inside, it is obvious that this school has had at least two lives. In what was once the main classroom, there are the remains of relatively recent partition walls that divide the main room into three. The floorboards have completely rotted so all that remains is a dusty clay underfoot. 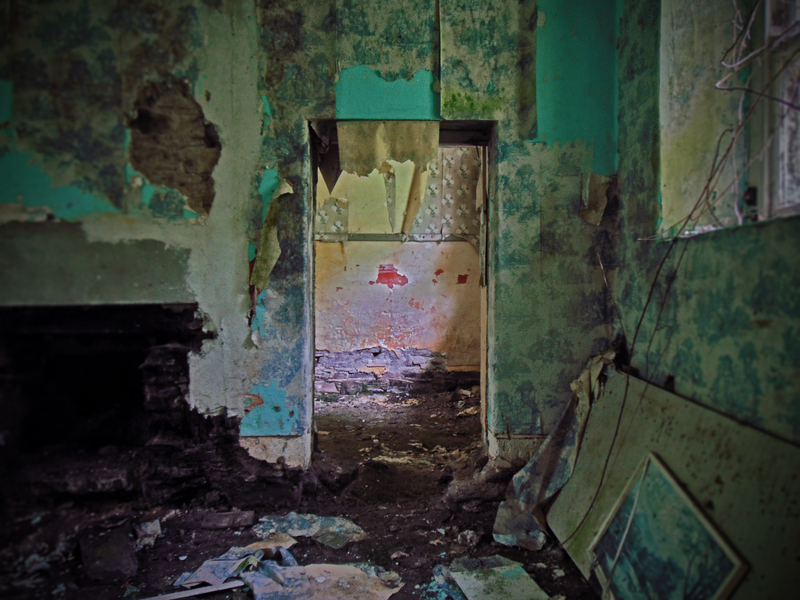 To my right is a doorway leading to a smaller room, perhaps originally a classroom for infants. 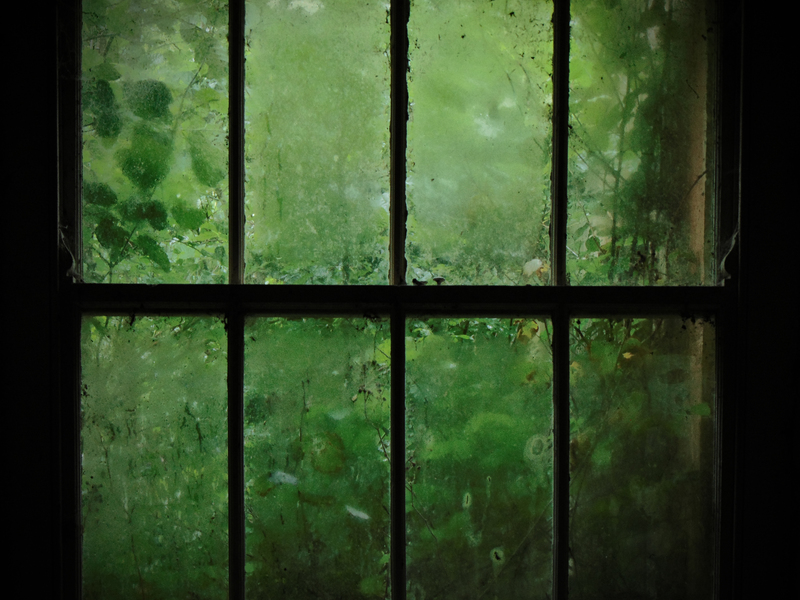 The walls are covered with a pealing patterned wall paper and it is dark inside; the trees and dense greenery preventing light from entering the building. To the rear of the building there is a modern flat-roofed extension. Here, there is a kitchen and bathroom with 70’s style fittings. It must be that when this building was no longer used as a school, it was converted to a house and lived in. But what of the former use of this building? The patterned wallpaper and partition walls make it difficult to imagine this place as a school house. 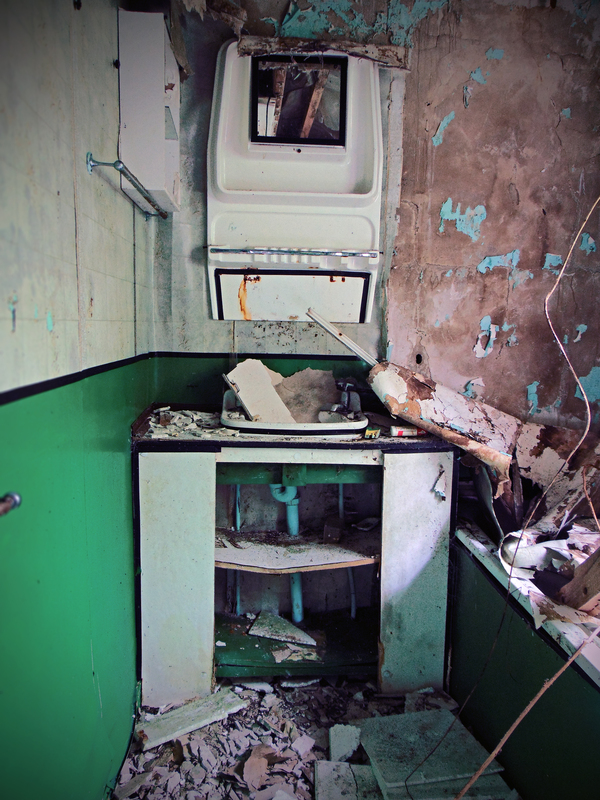 There are no school desks, no blackboard or other features of the school interior remaining. Only the name plaque on the front gable and the recognisable architectural style of the building indicate that this was once a local school house. However, a quick look through the records of the National Folklore Commission* show that in the 1930s, this building was still very much alive as a school. 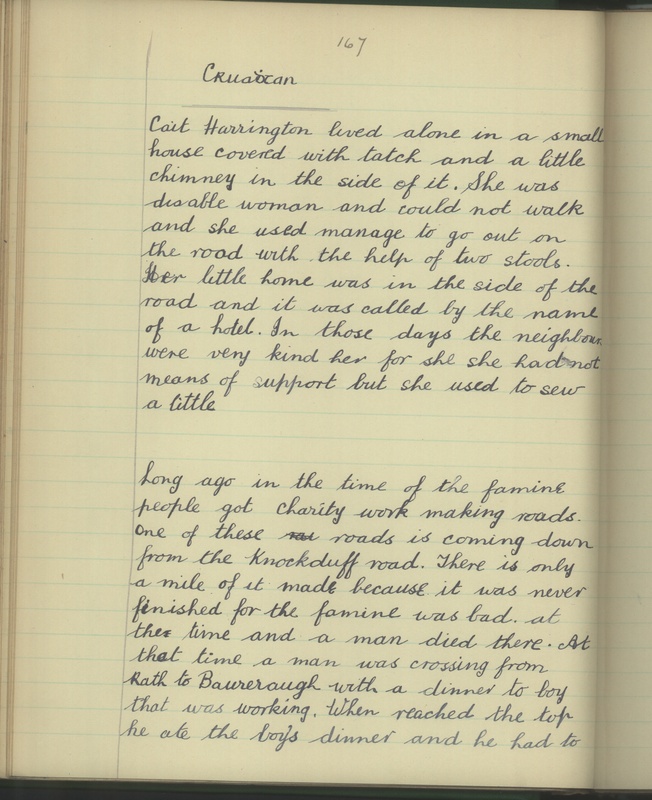 The records show a fine collection of stories and folklore from the locality gathered by the local school children at the time. Like Réidh Reamhar in Co. Galway, it is the landscape setting of this disused school that is most striking. The building is isolated now, and it is difficult to imagine a time when there were enough school children in the locality to necessitate a it. Perhaps this is what makes Gortnabinny National School interesting; it is a relic of the past and a legacy of the changing rural Irish landscape of the past 50 years. If you or someone you know attended this national school, please do get in touch and share any stories, anecdotes, photographs, or any other memories you may have. Wonderful writing today, I was drawn right in. 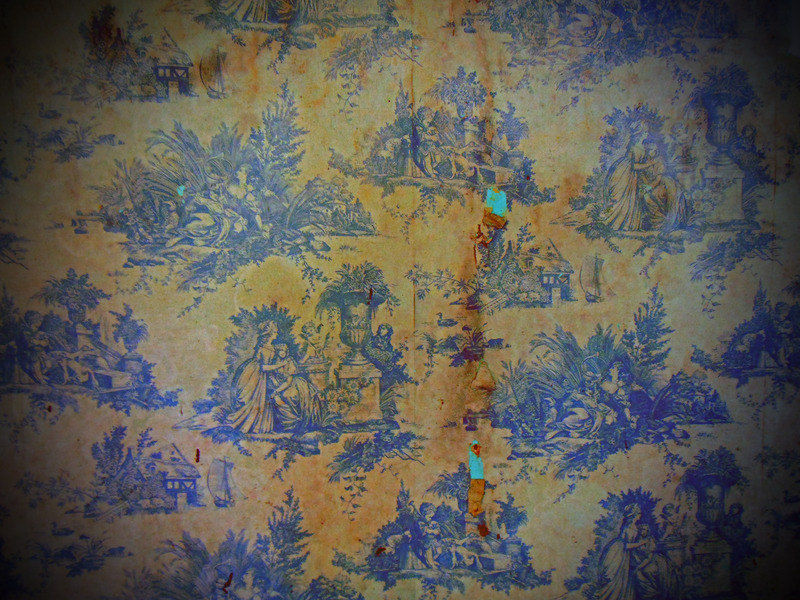 Great research as always and I love the unexpected wallpaper! Beautiful and fascinating. I am hooked! Thank you very much Sue! Thanks for visiting! Great ! will have the history f the school in the next publication of the Kenmare Chronicle. Pictures of the school kids are up on our facebook page. Thanks Simon. I’ll be sure to check that out.